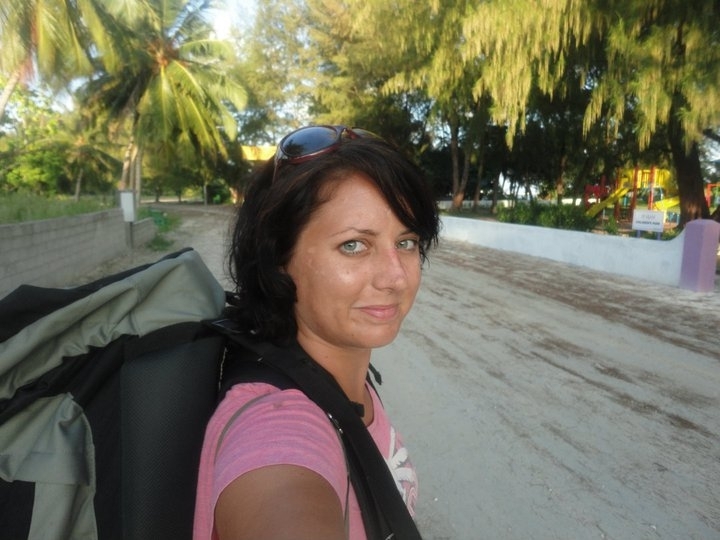 Intrepid explorer Donna Richardson backpacks around the Addu atoll for two weeks. Far from the well-trodden tourist route, yet with the best transportation links in the archipelago, the Addu atoll (known locally as Seenu) retains oodles of charm which has been lost in many parts of the Maldives in its quest for luxury. Until now, long-distance transportation has been limited across the Maldives but as more networks open up in the north and the south, along with the proposed expansion of Gan airport to receive more international flights, Addu is easily on its way to becoming one of the most backpacker-friendly atolls. What is more the new government is also actively encouraging independent travel now, with the creation of many more mid-market and budget beds, so there has never been a better time to visit the Maldives. Adventure awaits the independent traveller, in Gan, in the form of bike rides, diving and historic sightseeing. All of the islands in Addu Atoll, with the exception of the north-east islands of Hulhumeedhoo and Villingili, are linked by a causeway built by the Brits, which makes it easy to navigate. A total of six islands make up the western side of Addu Atoll. These comprise of Gan, Feydhoo, Maradhoo-Feydhoo, Maradhoo, Hankede and Hithadhoo. There are quite a few guest houses scattered around the islands. Situated on the edge of the atoll, the island of Gan has some of some of the best reef diving and snorkelling available in the country. The chance to explore island life on your own terms without spending a small fortune is one of the best ways to enjoy the Maldives. 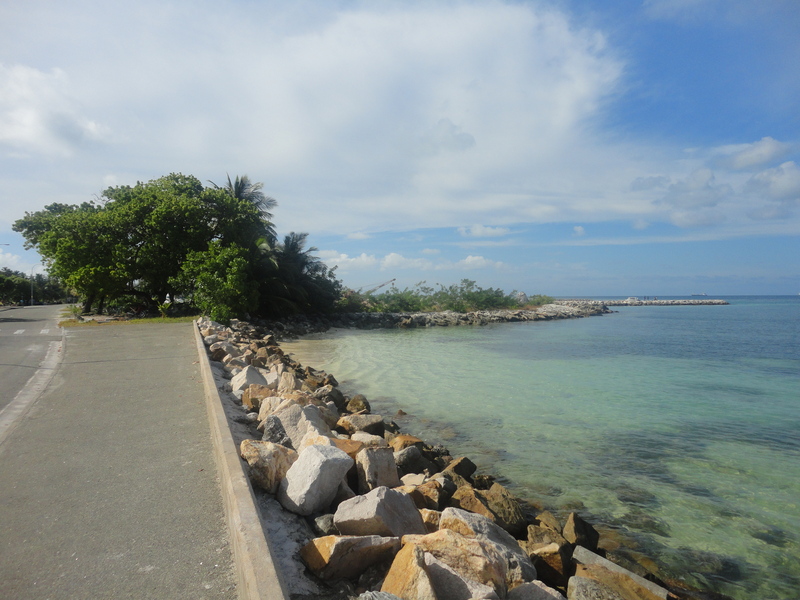 The island of Gan boasts one of the finest causeways in the Maldives which links no more than six islands. Its port Feydhoo, in the south-west of the atoll commonly known as ‘Gan-side’ has a bustling harbour which buzzes day and night. Many vessels sail in from as far as Male’ transporting cargo to the atoll and many safari boats dock just across the lagoon. From the port, you can take a taxi from one end of the island to the other for around 150Rf and depending on where you want to go, it is metered out per island at 40Rf. With the exception of Gan (the former British air base where the Equator Village resort is now located), Shangri-La’s Villingili Resort and Spa and Herathera Island Resort, most of the islands are inhabited by locals. The contiguity of local island life and resort life, plus the excellent transport links give travellers the chance to see the local Maldivian way of life which they can rarely experience so easily across the rest of the archipelago. Equator Village is the first stop for most weary travellers. With all the creature comforts of home, it is a perfect pit-stop to recharge the old batteries before heading off to explore the rest of the island by bicycle, which can be hired from the resort. Gan is the location for the airport and the former Royal Air Force air field and remnants of the old airbase still remain amongst the grounds, making for a pleasant day’s exploring. The buildings used in the 1970s which were not knocked down to make way for new factories for the former government include the Astra cinema, the ‘NAAFI’ (selling cheap supplies), the Gan Post Office and the Gan workshop. All these are reminders of its service history. There is an RAF memorial in tribute to those who served and a mosque stands on the site of the former church. 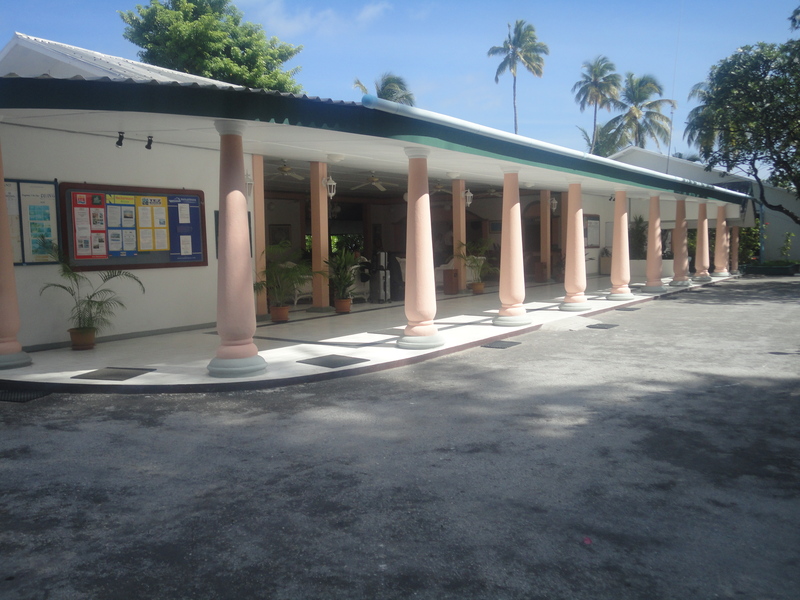 Several souvenir shops line the entrance of the gated resort and the reception is fashioned out of the former officers’ mess and, save a lick of paint, the rooms remain little changed from its service days. The wicker furniture adds charm and offers a very different experience to the clean lines of some of the Maldives’ newer, sleeker resorts. Charmingly rustic, this resort has a quintessentially English feel to it. A feeling of ‘home from home’ is evident in all aspects, from the free-range chickens which roam free around the grounds to the afternoon tea served daily from 4pm until 6pm. The open beach hosts a spectacular house reef which fortunately appears unspoilt from coral bleaching – with some of the best dive spots in the country. Snorkelling is pretty good here too, go a little deeper to the drop off point and expect to see baby devil rays, trigger fish and other tropical varieties. The resort enjoys a European, predominantly German occupancy. Next door, the Gan Island Club is under construction. This development is being carried out by MVK who was gifted the resort in exchange for providing transportation to the atoll. When this is finished, the guest house, formerly known as Dhoogas will be one of the best linked resorts in the Maldives – ideal for backpacking travellers. If it’s island life and culture you’re after, then hire a bicycle from your resort and take in the spectacular scenery along the coast and the traditional villages of the interior. Leaving Gan, you enter Feydhoo, just a short bicycle ride across the bridge by taking a right on to the main causeway. Optionally you can take a moped, as the locals do, or why not hitch a ride with a local? This breathtaking coastal route stretches 13km or so across the six islands. There are also inland routes through each island, but only the coastal route takes you directly through all the islands. Shops and roadside carts selling coconuts and mangoes uniformly line the roadside, with the occasional coral cottage as you leave the bustling port of Feydhoo behind. Maradhoo is a traditional village and it is well worth taking a detour off the spectacularly rugged and aqua blue coastal path to explore its traditional way of life. The basics are all here, from local shops to cafés, schools and houses. Amidst the coral cottages and roadside carts selling home-grown mangoes and bananas, various signals of economic development are evident. New cafes have sprung up and a sports car was parked outside a fine clothes shop, probably belonging to a businessman or politician. Meanwhile, the general population there and in neighbouring Hithadhoo lives on less than a dollar a day. At the Maradhoo – Hankede border you can find one of the best sundown spots on the west side of the atoll. A quaint café called Quways commands some of the best views of the sun set and you can see from the curvature of the island as it joins the next as you sit at one of the beachfront tables, or under a shaded deck area. It is worth a long refreshment before continuing on to Hithadhoo which is a long ride away. Hankede is the name given to the long stretch of road leading to the island of Hithadhoo. It is another five or so kilometres down a jungle-lined dual carriageway, which has tested the fitness of many a brave soldier. After you reach the Sri Lankan Airways sign, continue a couple of metres until you reach a soon-to-be opened green café with yellow and red umbrellas, owned by the former General Manager of the Vilu Reef resort. Hithadhoo is a traditional village but home to the southern region’s only public hospital and most of the population of Addu. Here you can shop for souvenirs and there are quite a few shops selling the latest trends. Most importantly you can explore the local way of life. Make sure you pause to drink from a freshly cut coconut at a reasonably priced 7Rf around 50 cents. 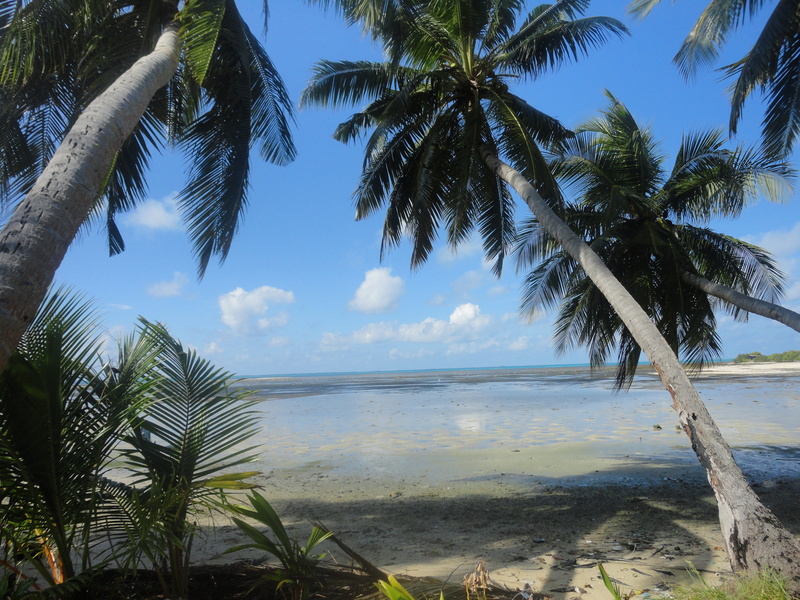 There is a small beach to the rear of the hospital, reached by travelling a distance down a palm fringed jungle path. Across the lagoon lies local tradition lies an island made up of two adjoining traditional Divehi villages (classed as islands in their own right) with a total population of about 2,600, many of whom live in little coral cottages with gated fences made out of palm leaves and bordered by quaint coral walls. Known as Meedhoo and Hulhudhoo respectively, these villages sit side by side and have very different personalities. A ferry, operated by MVK, departs daily from Feydhoo to Hulhumeedu. Legend has it that an Arab was shipwrecked here almost three centuries before Ibn Battuta (who is said to have converted all the islanders to Islam). The people are warm, friendly and hospitable. This is a fishing community and the port is a busy hub of activity day and night. Both have their own island chiefs and beliefs. Some of the surrounding islands surrounding are so beauteous that they make for idyllic castaway destinations. Quite literally, so – the South African version of the reality TV show, Survivor, was filmed on an uninhabited island just off the coast of Hulhudoo. The show’s producers donated a sundial made by the contestants to the village of Hulhudoo. If it’s history and culture you’re after then look no further than the sleepy island of Meedhoo, nestled in the far north east of the atoll. 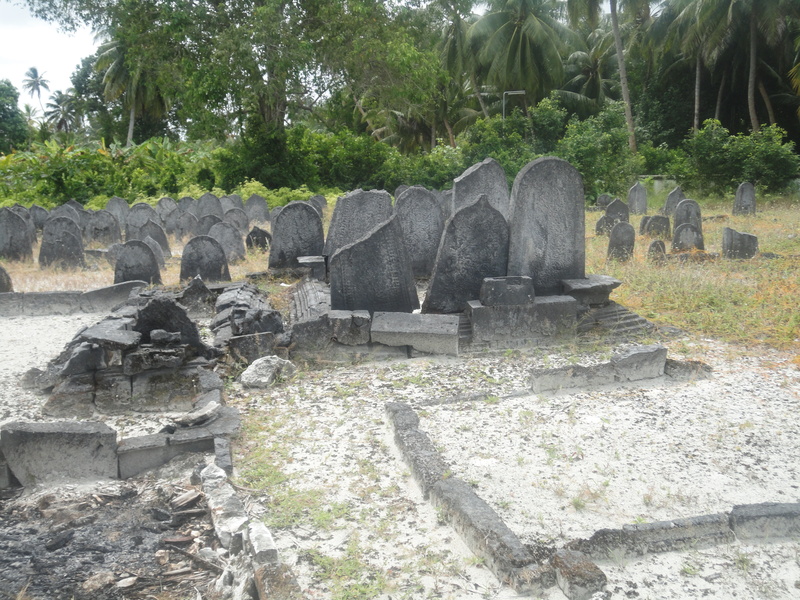 It is home to one of the oldest graveyards in the Maldives. The Koagannu cemetery is known for its ancient giant headstones many of which are carved with the archaic Dhives Akuru script. 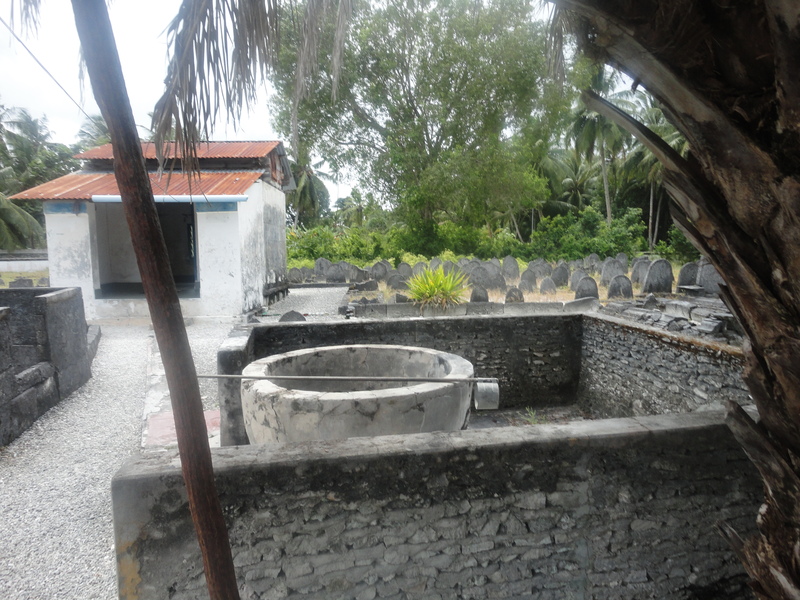 There are a few local shops, a park, three schools, a couple of mosques – including the oldest mosque in the Maldives, which is attached to the cemetery. Turn right out of the cemetery and take a walk down the unmarked sandy ‘beach road’ (in the absence of ‘infrastructure’ here all the roads are unmarked) and you will arrive on a spectacularly dramatic rocky beach on the south of the island. The islands are situated on the edge of the Indian Ocean with no land mass south until the Chagos Archipelago. At low tide one can walk along a former reef and exposed coral. Beach combing is one of the best activities on these islands, you can find perfect specimens of skeletal coral and huge unspoilt shells. 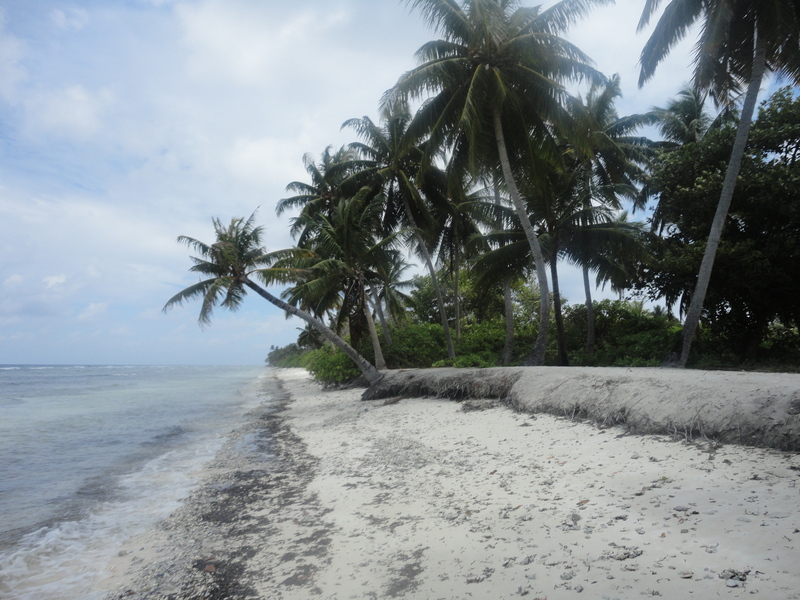 Sadly, these islands suffer quite badly due to beach erosion. The beaches of Addu are uncharacteristic of the typical Maldives picture postcard, but have their own particular charm. Standing on the ancient reef looking out to the ocean, and back towards the jutting palm trees and coved bay, local children were digging in the shallow rock pools for crab and shrimps, while a fisherman hunted for his supper with a pole and line. The dappled waves glistened in the midday sun. Haifa, my local guide and I headed back along the beach, avoiding squishing the hermit crabs scuttling over the white sand. White terns are the emblematic bird of the southern Maldives. These seagull-like creatures circle the weeping willow, oak and palm trees which grace the natural oasis. Hear them circling overhead. These are sea birds and as such, naturally have a penchant for fish – wherever you find a flock of white terns, you can be sure there is a rich fish supply nearby. Fishermen follow these birds to find the best spots. Since the white tern made its home in the islands, no other birds have migrated there, save the white stork, which can be seen on some of the less-frequented beaches. Terrestial animals are limited on the islands but look closely and ‘Mother Nature’ is all around, sit outside of an evening and you will see small frogs hopping around on the ground. They thrive in the boggy conditions of the mangroves. Gekkos crawl on the walls and above your head, lizards slide in and out of the bushes and crickets hum in the bushes while giant fruit bats swing in the trees. Agriculture is fertile here, unlike most of the Maldives. Equatorial climates have spurned many species of trees. Juicy ripe juicy bananas can be hand picked from gardens – some of the biggest in the Maldives that flourish with the perfect amount of sunshine and rain found in the Equator. Being close to former British airbase of Gan, the local people generally speak quite good English, particularly the younger generation, yet not quite so well as their cousins across the lagoon. Some of the local women dressed top to toe in ‘abyaas’ (Arabic robes) spend their days catching up with friends, sweeping the yard and cooking. Their husbands leave the house at dawn head off to sea on fishing vessels. Of the two islands, Meedhu is the oldest and is more conservative. Still there is entertainment to be found in this sleepy hamlet, mainly for the men and teenagers. As you near the harbour there are several restaurants. One of my favourites was the Parkland restaurant which is set on a charming deck overlooking a colourful children’s park full of swings, slides and wide open spaces. It boasts some of the best ice-cream in the Maldives. A couple of metres towards the harbour, Sunset Restaurant is more of a popular hangout joint for teenagers who park their gleaming scooters outside from noon until midnight. Veering right from the restaurant, close to Meedhoo harbour, there is a path which brings you out at a secluded stretch of beach. Only a short wading-distance across the lagoon is a small circular island with a lush green interior, which has been earmarked for resort development later this year. The Hulhoodoo side is covered in coral skeletons for the most part, and seaweed, but the most magnificent unspoilt shells and dried coral can be found by combing the area. Known locally as ‘Ismehela Hera’, locals wade across for picnics or take a ‘dhoni’ (boat). It is a prime spot to see the sun set against the dramatic backdrop of the lagoon. From Meedhoo, Hulhudoo is a short walk away, and is also linked by a public transport bus that goes back and forth a couple of times a day. Walking-wise, there are a couple of scenic routes through the island. The best views can be found by walking around the coastline. From Meedhoo harbour you can take a jungle beach path beside a mangrove and then through the coral village. Continuing along this path, across a crossroads at Hulhudoo takes you straight to Herathera Island Resort, soon to be re-launched as Amari resort. Meedhoo is seen as more conservative and traditional, while Hulhudhoo is more hip and trendy. It boasts a modern harbour and many shops as well as traditional stone cottages. Many young people hang out in Hulhudhoo. There is a school, an island office, mosques and cafes. Nodding at the social problems this and many other inhabited islands including the city face, there is a drugs rehabilitation centre just opposite the mosque. Generally there are more shops and things to do here for local people than in Meedhoo.. Fishing boats leave Meedhoo harbour early in the morning (around7 am) and return in the evening. They can be chartered across the lagoon, for the right price. Typically, hiring a speedboat costs around 500Rf (around $75US) any time of the day. However, last year MVK was awarded a contract to provide transport and infrastructure to the atoll. Already blessed with causeways in the south west of the island, MVK introduced regular busses connecting the airport with the resort of Equator Village and then through the islands of Feydoo, Mara-Feydhoo, Maradhoo and Hithadhoo. Regular busses have yet to reach the north east of the island and there is one daily bus from Meedhoo to Maradhoo. Generally cars are not encouraged on these islands and in the north east the transport of choice is moped. From Feydhoo there are also links to Shangri La’s Vilingili, Resort and Spa and Fuvahmulah on routes also operated by MVK. As yet, there is no such thing as a guest house on the north east side of the area. Here, ‘hotel’ means ‘tea house’. On the inhabited islands, travellers will find they need an invitation to stay with a local family and it is not advisable to just turn up unannounced. However, if you make some contacts beforehand, they will be more than happy to accommodate you. Contact the local island facilitator at the island office who can arrange for you to stay at the house of the kateeb (island chief) or a house maintained for the purpose of accommodating guests. Generally islanders are curious and intrigued by tourists and they will be more than willing to accommodate you in their own home or a friend of the family, although they will be offended if you try to pay them. By staying with a local family, you get to experience Maldivian food such as ‘mas’huni roshi’ and fish curry, although there are also a number of restaurants serving very cheap food. A meal and a drink costs as little as 20Rf, more than a third of the price of the lowest priced meal in Male’, and it is always served with a genuine smile from the heart. Service is also extremely good, and worth tipping extra for, as the waiters are more attentive and sociable than in the capital. When island life gets a bit too much, why not take a bit of R and R at Herathera resort, soon to be rebranded as an Amari hotel. Almost unheard of in the Maldives, where resorts are usually separated from inhabited areas, the bottom half of the Hulhumeedhoo island is adjoined to the enormous resort. You may wish to try, as I did, walking around 5km to the resort via Meedhoo and Hulhudhoo down a back road to get there and appearing at the staff entrance. Although it is not encouraged, and takes a certain amount of sweet-talking with security staff, it is completely possible to ‘infiltrate’ resort on foot via the islands, without a package holiday reservation. They will let backpackers holding British, European or American passports into the resorts but to avoid rows, it is best to ring the resort ahead to warn them of your arrival. While I was at the security gates, waiting for guest services to confirm if I could enter on a day occupancy, a few locals also tried to get into the resort, and were less successful than I. The trained Nepalese security guards are well versed in the art of keeping out intruders including some crafty crustaceans who also try their luck. 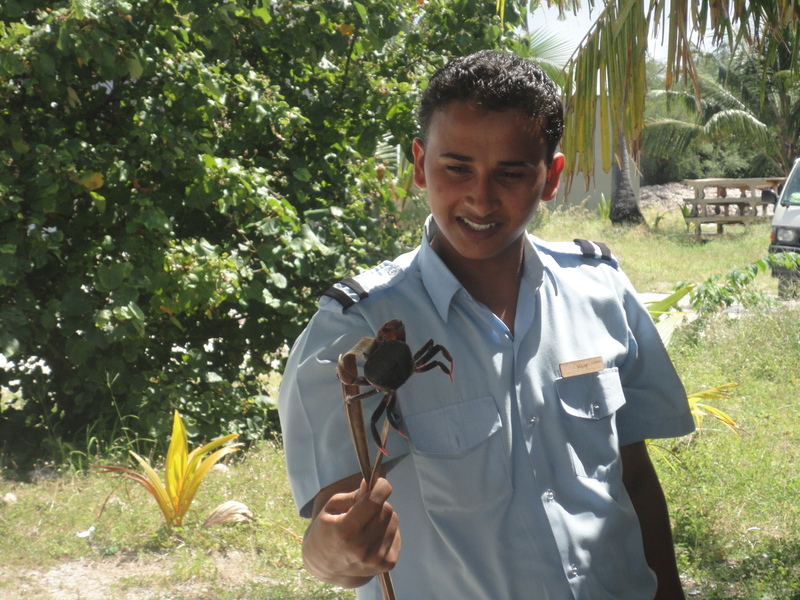 As the majority of those who work in the inhabited islands also work at the resort, sometimes other locals try to ‘blag’ their way inside, such as myself, but it is very rare. It is still quite rare for independent travellers to turn up unannounced, but after initial suspicions were allayed they were very friendly. 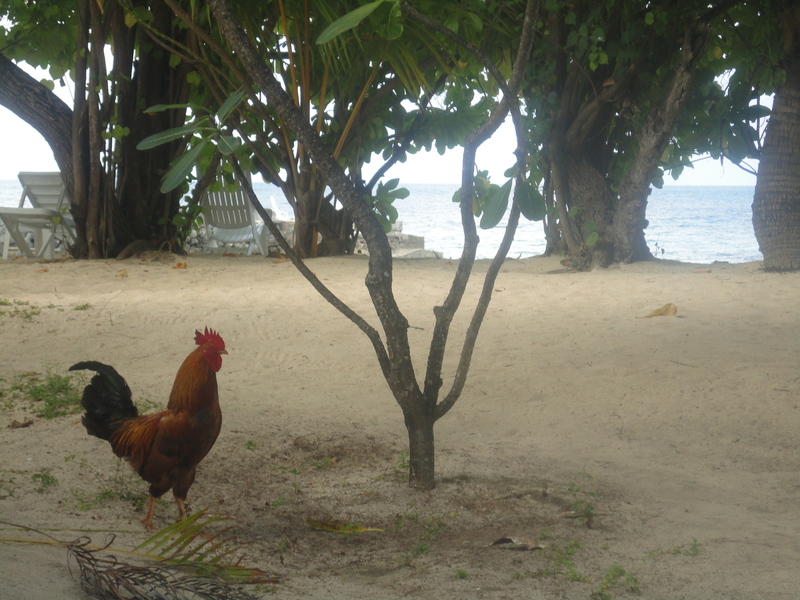 Some Maldivian resorts still have a somewhat haughty attitude towards unannounced guests. Many of the guests at the Herethera resort, mainly pilots and aircrew transiting through from Gan on a layover, are unaware of the inhabited islands just a stone’s throw away. There are sometimes day trips but when the hotel is running at low occupancy they are cancelled. While it is hardly up to luxurious standards yet, a room at Herathera Island Resort in peak season can still set you back around $300US per night. However for work permit holders or backpacking travellers, the hotel has a ‘day rate’ and will let you come and use the pool and amenities for a small amount. This mid-market hotel has certain charms about it, but will shortly be transformed under the Amari brand. From the moment you enter the foyer, decorated in red, white and black with simple flower decorations, you can kick off your shoes and relax. After checking in, a buggy arrives to take you to your room, or in my case, to the bar! There are two main bars and restaurants including one with the largest swimming pools in the Maldives, although this particular area was closed at the time of my visit, as the roof tiles had slid off during a storm so the restaurant was undergoing a renovation. With the present clientele in mind, the food is basic but quite cheap and pretty good quality, with pizza and free-flowing beer all afternoon (I think I racked up about eight from the afternoon to sundown, and it set me back around $30US- thanks to Happy Hour). This is fairly cheap saying that an all inclusive package would have set me back around ten times that price! For those with some energy to spend, want here is a fantastic well equipped beach for water sports and as a paying guest you are entitled to most of these facilities, with the exception of diving as part of the package. The backpacking market better hurry to Addu now, as with the development of the airport it looks like the upmarket brands are moving in. Under Amari, this resort is set to attract high-end guests. Flights from Hong Kong bringing in China’s rich kids have already started operating in the region. The ultra exclusive Shangri-La is predictably ‘la dee da’, and the only five star resort in the area, but well worth a day visit as long as you agree in advance with security and guest reservations. You can purchase a day ticket but in peak season it is virtually impossible. A daily staff ferry leaves Feydoo at 11am although as I discovered, you cannot get onto the island without an invitation. I should have known, when a private jet ferrying a prominent Indian billionaire and his family flew in to Gan airport earlier that morning, that the island was off limits to day-trippers. The wedding cost $5 million US and the family booked out part of the island for the private ceremony. Despite wearing a hat and my best frock, I still couldn’t get myself onto the guest list. Arriving on a wooden dhoni, I was politely escorted back off the island via the VIP jetty, in a stylish speed boat of course. Meedhu and Hulhumeedu have different island councils and their own local election candidates. An MDP stronghold, yellow banners showing the party colours are strung along the island at election time. When I visited, Addu was the focus of media attention due to the court appeal filedby Dr Hassan of Hulhumeedhoo opposing the governments’ plans to turn Addu into a city. But the court overruled the decision and now Addu is set to become a fully operating city. The atoll will be home to the SARC (South Asian Regional Cooperation Council) conference later this year and much is to be done to prepare the infrastructure. Contracts have been awarded for many projects and activity and interests are rising in the horse-shoe shaped atoll, which after 30 years of hurt and abandonment finally seems to be getting its share of good fortune and luck. Call Captain Hakeem of Best Line on 792 3414 or 799 5737 or go to the fruit and vegetable market in Male’ to try to hitch a lift with another cargo boat. Typically they leave on a 10 day cycle, so you can blag a return trip too. Safari boat-consult a travel agent locally such as Voyages Maldives, Sultans of the Seas or ask Liveaboard Association of Maldives www.liveaboardassociation.mv. *Please note venues and prices are constantly changing in the Maldives. 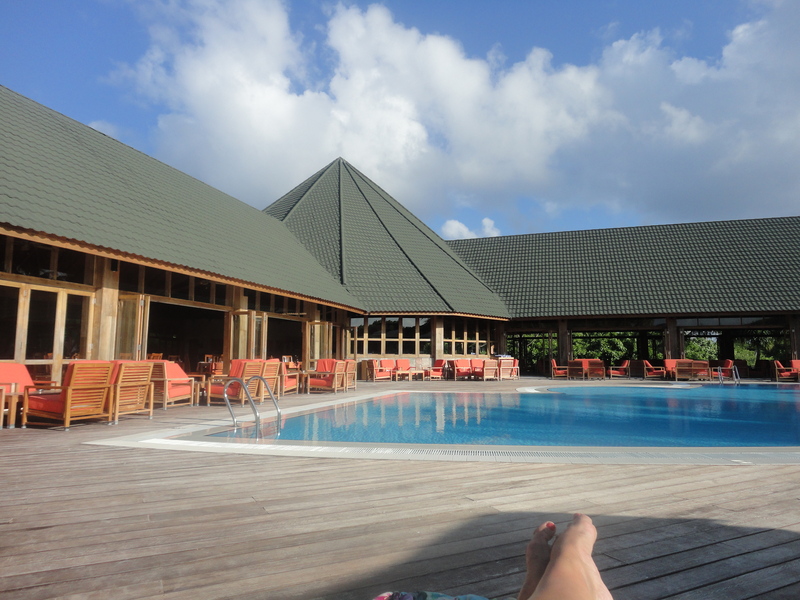 Herathera Island Resort resort will be rebranded to Amari before the end of the year so expect hikes in prices. Donna Richardson is a Freelance Travel writer based in the Maldives. To use this article please contact 0044 7910004491 or donna_richardson_@hotmail.com. Further hi-res images available on request. 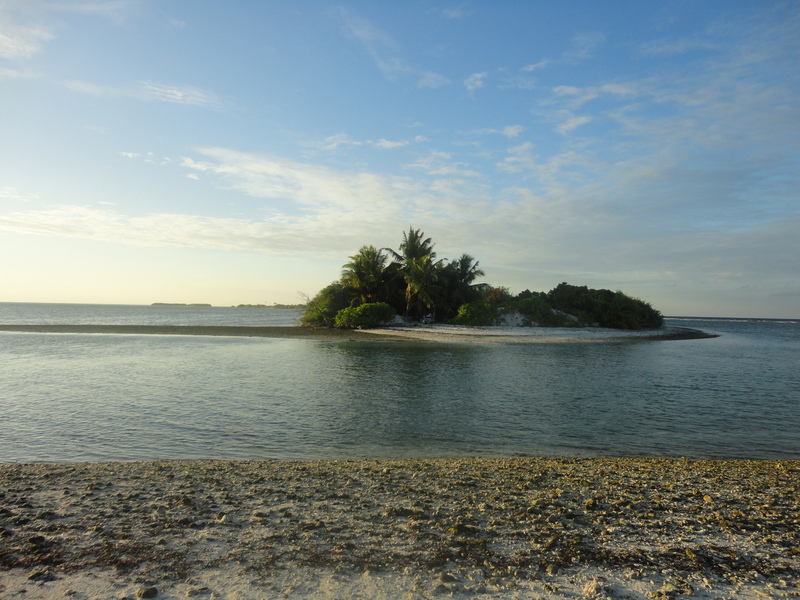 nice blog about addu atoll.